I mean, haven’t we had this conversation already? “I’m not racist, but…” is one of those phrases that virtually guarantees a statement will be a lie (along with “…and I turned out okay”). Johnny Storm, like a goodly whack of comic book, literary, animated, or other characters who are only white because when they were created, that was the default. There’s nothing inherently white about them, whatever that may mean (and that’s a can of worms I’m gonna leave unopened), and there’s no reason they can’t be black, or asian, or female, or gay, or any number of other identifiers outside the cultural default. Johnny Storm’s ethnicity doesn’t figure in at all, other than in relation to Sue Storm, and that’s something that can be handwaved away with one line of dialogue, as simply as explaining why the very Irish Chris O’Dowd is there to bedevil Kristen Wiig. And we mentioned T’Challa, who, being, y’know, an African king, would probably be a little darker than Mowrer or myself. I wouldn’t even call that a race thing, as much as simply a character thing. His heritage informs his character, the way being from the Southern Air Temple informs Aang, being British informs John Constantine, or having two heads and three arms informs Zaphod Beeblebrox (though I’ll grant that certain other practicalities necessitated that casting decision). “Well, why doesn’t it work the other way?” asks a certain segment of the population, who always feel the need to argue such points. “Why is it racist if a character’s whiteness informs their character?” Well, M’sieur Strawman, it’s not inherently racist, unless it’s a character who specifically is racist. Apart from that, I can point to a major character who practically needs to be white. This issue caused a stir in the Wizard letter columns back in the early days of Ultimate Marvel, when Marvel’s management let it be known that they might be adjusting races, genders, or orientations of familiar characters. There was the contingent arguing that making Cap black was nothing but “political correctness” (and geez, can we find a new phrase already?) designed to “pander” to black readers. On the other side was the contingent arguing there was no reason Cap couldn’t be black, and anyway, what’s wrong with trying to expand your demographic? 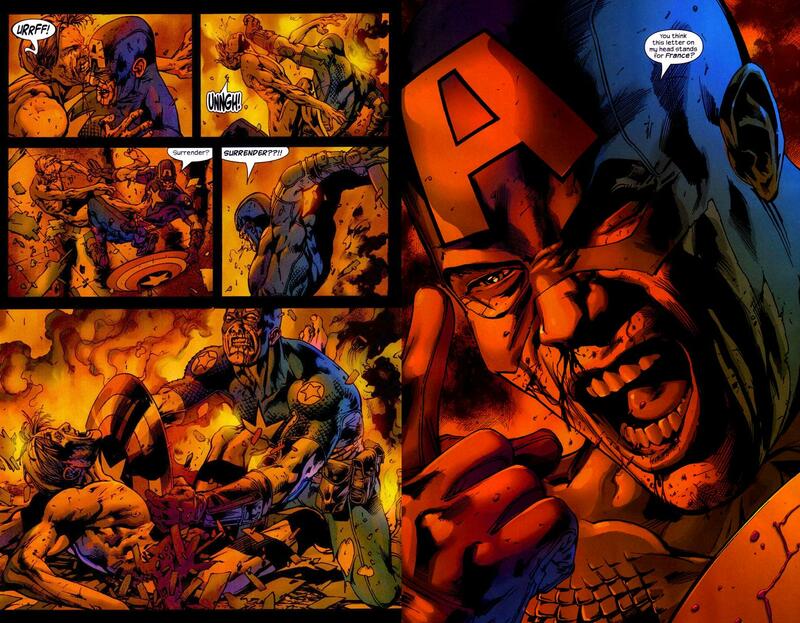 Here’s the thing with Cap, though: both on the page, and in reality, Cap was designed to be an American propaganda tool in World War II. He was intended as a symbol for the country to rally around, and if you look at the war propaganda of the time, what kind of faces do you see? Allow me to reference my earlier statement vis-a-vis the default at the time. This issue was later addressed in the excellent miniseries Truth by Robert Morales and Kyle Baker, that thematically linked the development of the Super-Soldier serum to the Tuskegee Experiment. And while Ultimate Cap remained white (albeit with the jackass level turned up to 11), we did get Ultimate Nick Fury, which has worked out well for all involved. Well, that got intense, didn’t it? I need to namedrop Barney Miller again, and quick! BTW, part of the inspiration from this strip came from Donald Glover, who experienced this kind of kerfuffle firsthand a couple of years ago.